The reason why speaking English with 100% expertise can be a challenge is because English language schools and testing facilities focus only on four language skills – listening, reading, writing and speaking, but do not include proper pronunciation. 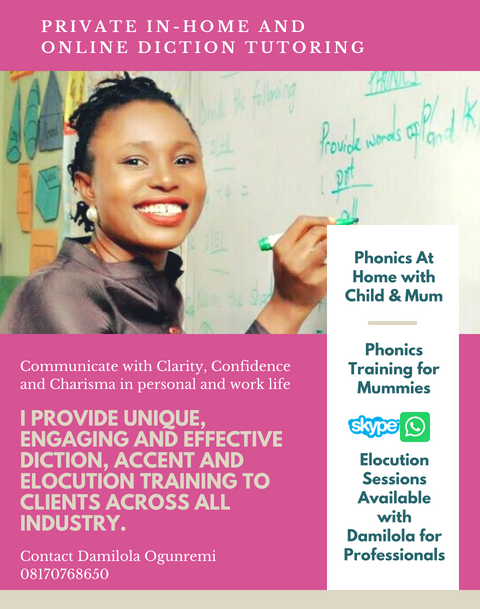 Without pronunciation training, your vast knowledge of English grammar and vocabulary may be rendered inadequate and this reality can hold you back from being successful when stepping in the forefront to represent your company or climbing that proverbial corporate ladder. And if you are a mother of a child, your lack of good pronunciation may create an impediment to your child's literacy. Work with me and let me guide you to appropriate consonant and vowel usage and more Standard English British, so your communications are precise. We will remove all obstacles of miscommunication. BOOK YOUR PRIVATE CLASS NOW. Call 08170768650.